Love this angle shot showing the backside of the card a bit too. Unfortunately it doesn't really show off the glossy effect on the glass though. Used a 'Summer' rub-on in the bottom corner of patterned paper. Wrapped some cotton candy pink & white bakers twine around the patterned paper before affixing it to the card base. Tucked a 'haute' pink ticket stub into a paper clip and tucked both to the edge of the patterned paper. The chipboard 'smile' sentiment pops up off the card with foam tape. The HOUSE MOUSE stamped image was colored with a combination of copics and other markers till I was satisfied with the results. 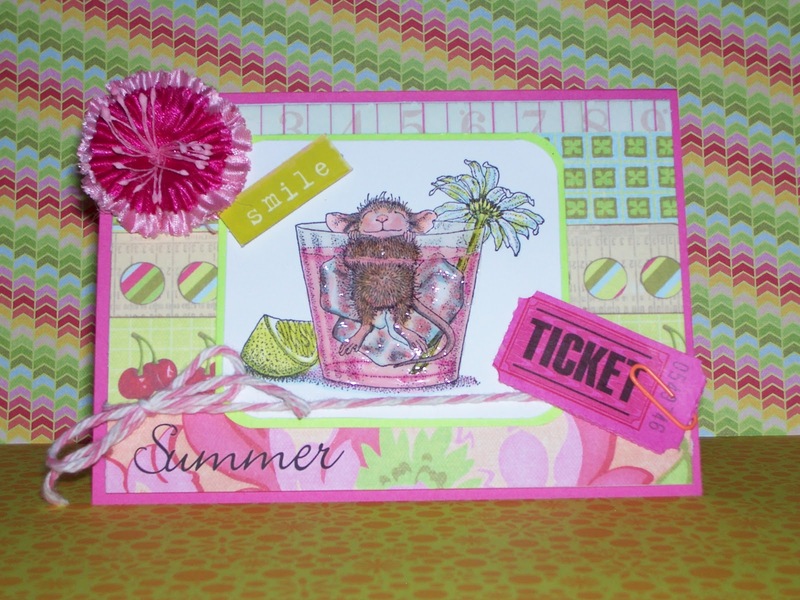 The pink flower that finishes the card is sweet and it actualy came to me via a swap on PCP and I decided to use it here with the help of my kiddo who said it looked like a Hawaiin flower and fit the SUMMER theme. Wow, love your bright summer colors! That stamped image is perfect for our challenge and colored up beautifully. Lots of details and embellishments on this one, makes it fun to look at and enjoy. Lucky recipient! 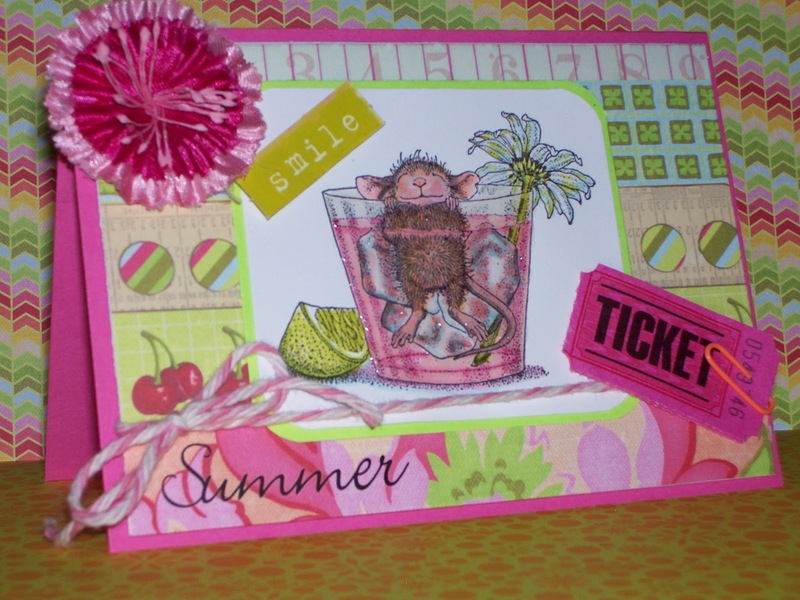 Thanks for joining us at the House Mouse and Friends Monday Challenge. Nicely done! Thanks for sharing at HM & Friends chall this time..good luck in the candy draw make sure you check out all the DT blogs ..
A gorgeous card Cathie, your colours are stunning, such a sweet image and fantastic details.....beautiful flower.